Toddler Creative Movement: This course of study begins at 18 months - 3 years. During this 30 minute weekly class, the Toddler begins to learn self-discipline, listening skills, group work and individual work. Children will learn basic terminology associated with classical ballet vocabulary and will begin work on the basic locomotor skills. As the Toddler moves toward the Preschool Courses, we work toward pushing off the floor more. Preschool Creative Movement: This course of study is a structured class designed for the early development of technical ballet and movement. It challenges the pre-schooler by providing a carefully paced sequence of exercises to develop physical conditioning with poise and grace. These classes are for children age 3 and 4. It is not necessary to have started as a Toddler dancer. Children in this division learn self-discipline, listening skills, coordination skills, left and right discrimination, patterns in movement, locomotor skills and pre-ballet to ready children for Ballet I and II and the Pre-Intermediate (Ballet III) level of study. Ballet I and II work to provide the young student the basic foundation of proper placement, focus and basic technique needed to advance to higher levels and more frequent weekly classes. These classes still meet once a week for not more than 1 hour and 15 minutes each week. While these levels are more advanced than the Creative Movement / Pre-ballet levels, the emphasis is still on allowing the kids to be kids. Boys Do Ballet: A focus on the male student only. This class is designed to give our young male dancers and opportunity to study without the girls!! The focus is on proper technique for the young dancers with the younger male dancer in mind! Lots of jumps! Ballet II and III (Beginning Ballet II and Pre-Intermediate Ballet): During this course of study, the student will begin studying ballet twice weekly. On-going work on proper placement, port de bras and proper technique is the focus of this level. 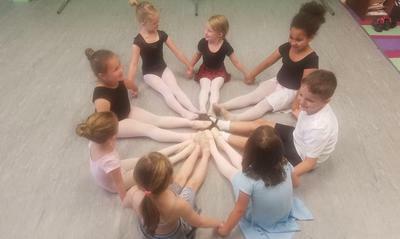 The student will need recommendation by the Director for the study of pre-pointe training. Ballet IV-V (Intermediate and Advanced Ballet): Students in this division have decided to continue their serious study of classical ballet whether or not a career in dance is pursued. Multiple classes per week are offered in this division. Students will be advanced to the study of pointe by the recommendation of the Director only. The Intermediate or Advanced student who is studying en pointe is required to maintain at least 3 hours of regular ballet technique in order to continue their pointe work. Variations and Partnering also are available to students by invitation. ​​​The adult division at the Academy was created for the beginner teen / adult student of ballet or for the adult who studied ballet earlier in life but did not choose to continue a serious study. Classes in this division are held twice weekly. Little or no experience is expected in this division. The teen / adult student will learn at an individual pace and will focus on proper body alignment for safety and correct execution of the steps and combinations taught. Modern: Modern dance is a formal style of dance branching off of the classical ballet technique. Classes in modern dance will include structured floor work, across the floor work and more. Deemed less restrictive than the classical ballet discipline, modern dance is not a dance form that rejects the ideals of classical ballet but instead to offer the student of modern dance an opportunity to use more of the body in a less restrictive way. Students of modern dance will explore the ideas of Martha Graham and more.